“Case #10-5411 Veterans Administration” from Christian Faith Publishing author Carol Mulhern details corruption within the VA based on the author’s personal experiences. Through her work at the Coatesville Veterans Affairs Medical Center, author Carol Mulhem learned firsthand how corrupt and self-serving officials worked to further their careers at the expense of their coworkers, the organization, and veterans. “Case #10-5411 Veterans Administration”: a personal account of corruption and retaliation within the Coatesville Veterans Affairs Medical Center. “Case #10-5411 Veterans Administration” is the creation of published author, Carol Mulhern, single mother of two girls and survivor of domestic abuse. In June 1990, Carol Mulhem started work at the Coatesville VAMC as a file clerk then later became the medical support assistant in 2005. She received vocational training in data entry in addition to her high school education and the literary training she received at various libraries. Published by Christian Faith Publishing, Carol Mulhern’s new book details her experience with corruption and retaliation while working at the Coatesville Veterans Affairs Medical Center. Mulhern shares, “Most employees of businesses and government agencies like to believe they and their organizations are immune to deceptive practices, but they are not. People are very clever when it comes to fraud and other deceptive practices. Honest and trusting people develop strong relationships with others, so they do not want to believe those they trust can have ulterior motives. Deceptive and self-serving people are, however, only interested in what is good for them and not what is good for the organization or their customers. For some VA officials, their pay check comes first, not the veterans. These corrupt officials are skilled at maintaining the illusion that they are loyal and good managers, so no one ever questions their self-serving and malicious behavior. ‘Case #10-5411 Veterans Administration’ recounts the author’s experience working with VA managers who are willing to get ahead in their careers at the expense of their co-workers, the organization, and veterans. Unfortunately, many of these people do get away with it. In her book, she reveals how officials deprived veterans of benefits for their own gain. View a synopsis of “Case #10-5411 Veterans Administration” on YouTube. 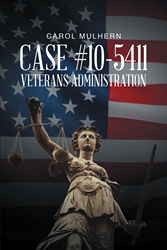 Consumers can purchase “Case #10-5411 Veterans Administration” at traditional brick & mortar bookstores, or online at Amazon.com, Apple iTunes store, Kobo or Barnes and Noble. For additional information or inquiries about “Case #10-5411 Veterans Administration”, contact the Christian Faith Publishing media department at 866-554-0919.